About 65 km from the district headquarter in the Pandriya development block is a village called Polami. The village is situated in a hilly terrain and is mainly inhabited by people of the Baiga tribe. Various works have been done under various schemes for the people belonging to the backward Baiga tribe. Lives of Chaitram Baiga and his father Jhingru’s have changed because of the government schemes today. Forced to live in a shattered cottage, Chaitram was having nightmares during bad weathers and rainy seasons. Chaitram's wife, two sons and daughters-in-law live together in the same house. Being a small hut, it was getting difficult to even pass through the hut. Considering his poor economic situation, the Gram Sabha decided to give him the benefit of the Pradhan Mantri Awas Yojana by passing the resolution with consensus. In order to fulfill the basic needs of his life like food, cloth and house, the district administration also made better efforts. Considering the needs of Chaitram, a permanent house was sanctioned by the Pradhan Mantri Awas Yojna Gramin for the cost of 1.30 lakh rupees. Chaitram Baiga also tried to make the house bigger by gathering some money on his own, as there were also sons and daughters-in-law who lived with them and needed separate rooms for themselves. Chaitram Baiga already used to work in Jobcard under the Rojgar Guarantee Yojana. Getting a house was like the solution to his biggest problem in an instant. Earning money by labouring for his own house, was like cherry on cake. Because the government paid him for working as a laborer for 95 days in making his own house. 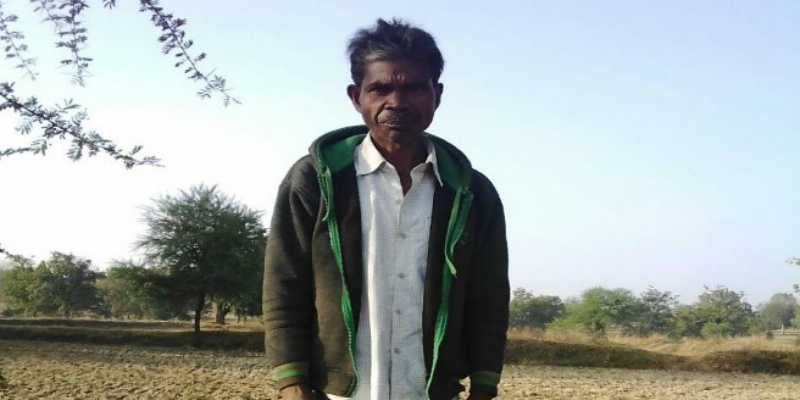 He earned wages worth 16,000 rupees, which helped him manage other household expenses too. But the biggest gift that they received was of stone-mason training in their home under the Livelihood Training. Their own house was selected in order to train five people for the stone-mason training. This even saved the cost of construction of the house. In this way, they were able to save around 75,000 rupees from expenditure on the house. And, the remaining 90,000 rupees for the house has been spared out of the 1.30 lakh rupees allotted, which will give them financial support for a long time. Collation of the two-acre farm of Chaitram was coordinated through the various schemes. Because of which they are already able to produce more crop. The veterinary department gave them two bulls for their agricultural work, due to which they are able to work in their fields with great comfort today. Considering the number of women in the house, toilets were also constructed at a cost of 12000 rupees under the Swachh Bharat Abhiyan. With the construction of toilets, Chaitram's family got better facilities to use the washroom in their own home. Lack of water is not an issue for Chaitram’s family at all. Because Chaitram has made his own well in his own field. And then the CREDA, without any delay had put the solar panel and piped pump in their well. Now they are growing their own vegetables on their own field by watering it from their own water for all 12 months of the year. These seasonal vegetables also fetch them good income. To stay informed about entertainment and work, the Forest Department gave them a radio set. Using the ration card, Chaitram's family started getting daily food and beverages like rice, gram, sugar and salt at a very low rate. This gave them an opportunity to save the wages that was earned by working in the village under the Rojgar Guarantee Yojna. The Health Department gave them a smart card, which helped them in getting hassle-free medical treatment. Now, Chaitram and his family members easily get themselves treated at any government or private hospital with full comfort. Their village being a forest area, mosquito nets were provided to them in order to protect themselves from mosquitoes and other insects. The Pradhan Mantri Ujjwala Yojana has got them a cylinder and hearth for only 200 rupees for a clean fuel and a smokeless kitchen. Now the women of the house do not have to pick wood and cut it to make food. They have the freedom to cook food and eat it whenever they feel like. Chaitram explains that he has got a single-light connection from Pandit Deendayal Upadhyay Gramin Jyoti Yojna, which is currently located in his hut. As soon as their permanent house is ready, this connection will be operable and they will be able to light it. Chaitram and his family is very happy with the various schemes his family have accessed. With a smiling face on his face expressing his happiness, he says, "I am extremely thankful to the Government that he has given me and my family the most important facilities like employment and toilets. And most importantly, because of the Government, I am able to build my own house. Now, in 15 days, I will be comfortably living in my new home.” clearly, Chaitram and his family’s life has been changed by the various benefits they have received from the government. Today, they roam with pride in their village Bagpara, and boast about the government's plans to all the people. Seeing this change in their lives, people say that are blessed to have such a government, which has made them reach this level of lifestyle and helped them join us the mainstream of the society.